Take the cheese out of the refrigerator when you start the recipe to ensure that it comes to room temperature by the time you need it. Cold cheese will retard rising. Plan ahead: The dough needs to rise for several hours before baking. 1. FOR THE BREAD: Whisk flour, sugar, yeast, pepper flakes, and salt together in bowl of stand mixer. Whisk warm water, eggs and yolk, and melted butter together in liquid measuring cup. Add egg mixture to flour mixture. Fit mixer with dough hook and knead on medium speed until dough clears bottom and sides of bowl, about 8 minutes. 2. Transfer dough to unfloured counter, shape into ball, and transfer to greased bowl. Cover with plastic wrap and let rise in warm place until doubled in size, 1 1/2 to 2 hours. 3. Grease 9-inch round cake pan. Transfer dough to unfloured counter and press to deflate. Roll dough into 18 by 12-inch rectangle with long side parallel to counter’s edge. 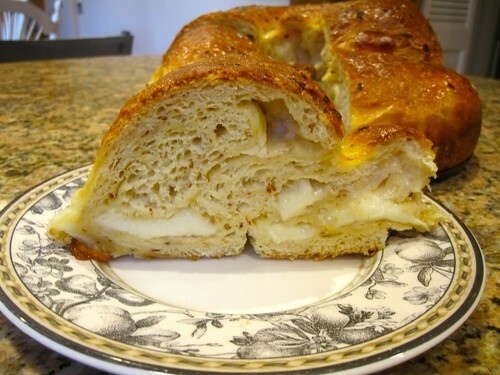 Distribute Monterey Jack and provolone evenly over dough, leaving 1-inch border around edges. Starting with edge closest to you, roll dough into log. Pinch seam and ends to seal, then roll log so seam side is down. Roll log back and forth on counter, applying gentle, even pressure, until log reaches 30 inches in length. If any tears occur, pinch to seal. 4. Starting at one end, wind log into coil; tuck end underneath coil. Place loaf in prepared cake pan and cover loosely with clean dish towel. Let rise in warm place until doubled in size, 1 to 1 1/2 hours. Adjust oven rack to lower-middle position and heat oven to 350 degrees. 5. 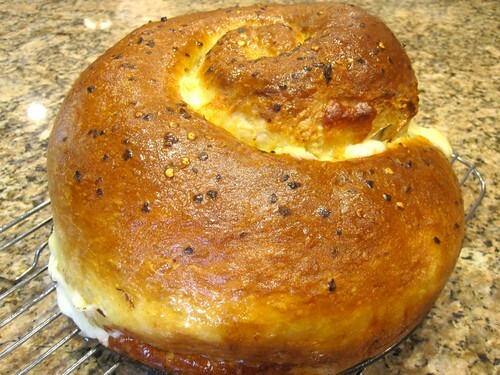 FOR THE TOPPING: Brush top of loaf with egg, then sprinkle with pepper flakes. Place cake pan on rimmed baking sheet. Bake until loaf is golden brown, about 25 minutes. Rotate loaf, tent with aluminum foil, and continue to bake until loaf registers 190 degrees, 25 to 30 minutes longer. 6. Transfer pan to wire rack and brush bread with butter. Let cool for 10 minutes. Run knife around edge of pan to loosen bread. Slide bread onto wire rack, using spatula as needed for support. Let cool for 30 minutes before slicing. Serve warm.